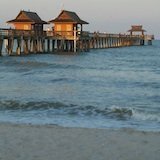 This web page is an online tour of Naples Florida. 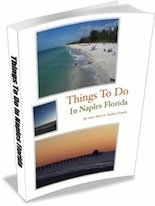 From here you'll be able to see what's available to you in all of the different areas in Naples. Since this isn't really that small of a town, there are lots of restaurants, shops, businesses, parks, beaches, and activities spread around the area. This page organizes all of that for you so that you can learn about the best places to go in the area you'll be in. Or whatever the case may be I'm sure that this page will be really useful for you if you're new to the area or are just visiting. A state park beach located on the western most point of Immokalee Road. There are picnic tables, boat ramps, lots of parking, and an entrance fee. This one is right next door to Wiggins Pass, just south of it. There's an entire parking lot on Immokalee Road (before the bridge, decent walking distance from beach) plus some right at the entrance too. This beach is in the southern area of North Naples at the western most point of Pine Ridge Road / Seagate. This is one of my favorite places down here. The new Mercato shopping center has a Whole Foods grocery store, an awesome movie theater, and a bunch of new stores. There are even condomoniums here that people live in (above some of the stores). This is one of our favorite restaurants in the area (it's Andrea's #1 ever she says -- and I know why). Great if you like spices and unique flavors, or have had Indian before. Or if you want to try something completely new (if you haven't before). A healthy food joint in North Naples at the corner of Airport Pulling Road and Immokalee Road. 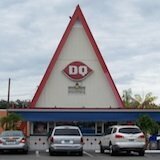 They have two locations in the North Naples area. 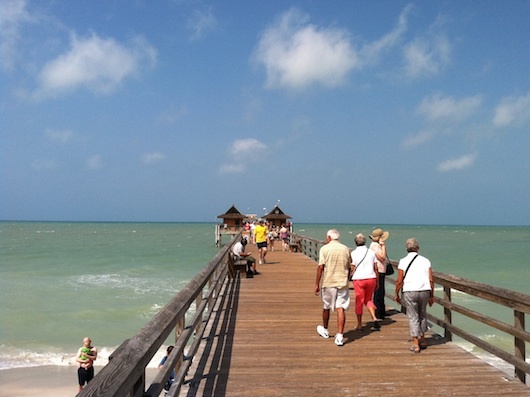 The famous Naples fishing pier is in the downtown area. Even if you don't fish, you'll love the views and wildlife. Beaches located in the City of Naples. In this area there are multiple beach access points at the ends of each street. A big beach park in the area with picnic tables, a playground, beach volleyball courts, and gazebos you can rent out for parties, weddings, or family gatherings. Thai restaurant that has the best Pad Thai I've ever had. They have a location in the area right on Fifth Avenue South and US-41. 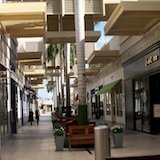 Famous Fifth Avenue South has restaurants, high end shopping, art galleries, coffee shops, gift shops, and it's all just a few blocks from the beach. A sort of "extension" to Fifth with more options in shopping, restaurants, art galleries, coffee shops, and more. Third Street is parallel to the beach which is only a few blocks away. Shopping, dining, and coffee shops right on Venetian Bay. 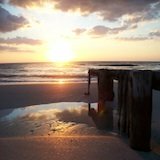 Limited shopping, waterfront dining, and the Naples City Dock. Funky buildings, colors, shops, and waterfront dining on Naples Bay. A delicious and friendly locally owned restaurant in East Naples -- famous for their breakfasts and lunches but now offer dinner too. More in the works -- check back often for updates. Better yet, get on the list and we'll let you know what's new once in a while.